One of the harbingers of spring is the commencement of the series of outdoor music festivals that stretch across North America. 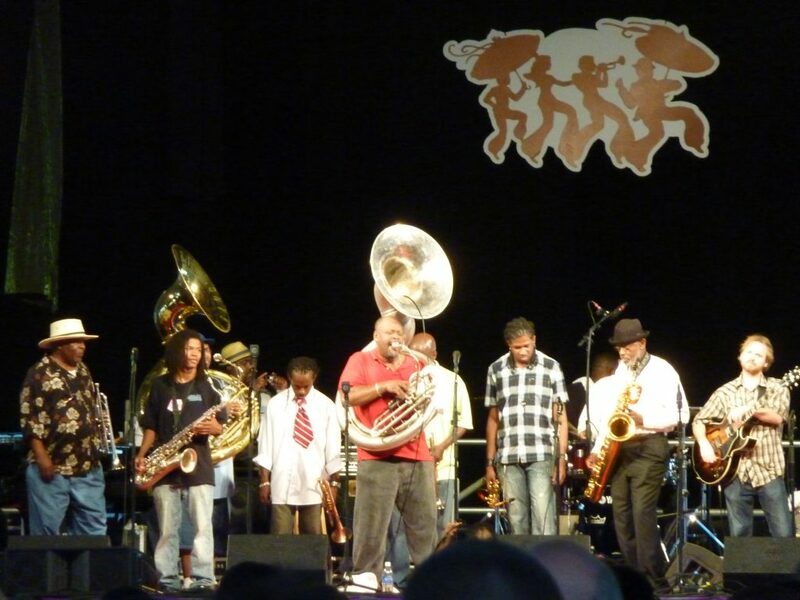 Starting with events like the New Orleans Jazz and Heritage Festival in late April, performers begin their annual festival tour schedule that takes some of them across the continent through the summer and into the fall. Whether you want to hear new sounds, relive your youth, see a popular act or introduce your kids to the many kid-friendly venues, there is a festival coming to a town near you. The New Orleans Jazz Fest began in 1970 as a celebration of the home of jazz and has developed into a jazz and heritage festival attracting up to 400,000 visitors each year. 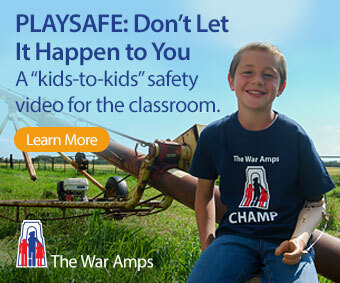 It features jazz, blues, zydeco, Cajun, funk, gospel, country, R&B and West African music, as well as the recent additions of hip-hop and, for the first time in 2010, Seattle grunge scene graduates Pearl Jam. Highlighting that performance was a live feed, shown on the big screens flanking the stage, between the Pearl Jam session and friends of the band who are with the US military stationed in Iraq. Talk about taking the music to the people. 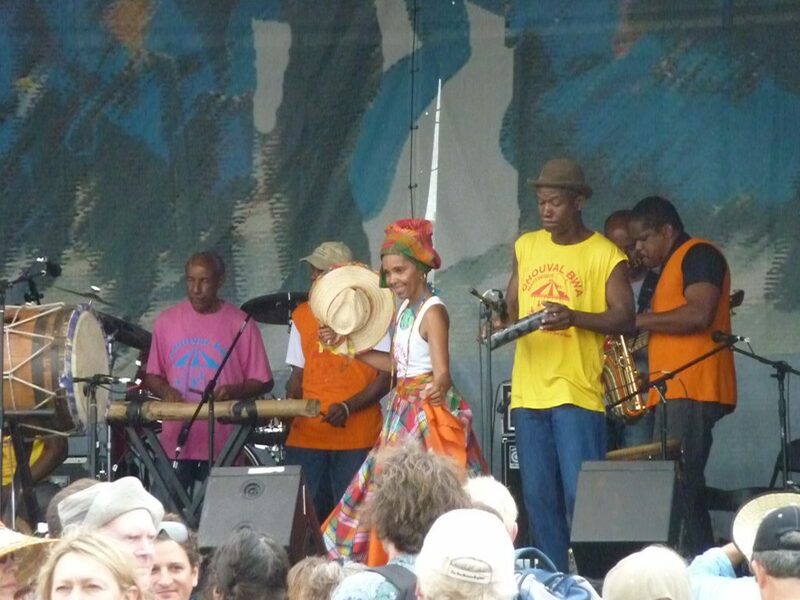 But to be sure, the Jazz Fest’s renown is the list of top acts that it attracts every year. Headliners in 2010 included such venerable artists as B.B. King, Aretha Franklin, Simon and Garfunkel, Van Morrison, Ellis Marsalis, Lionel Richie and The Allman Brothers Band, as well as popular artists like Buckwheat Zydeco, The Black Crowes, The Gipsy Kings and dozens of other artists including many of the legends of jazz and blues. Alongside Jazz Fest is the rich line-up of music at the clubs and venues around town during the event. Scheduled acts and jam sessions can run until early in the morning and attract lots of Jazz Fest participants, both performers and fans. It’s no small wonder, then, that the daily schedule at the festival grounds doesn’t begin until 11 am. Jazz Fest takes place over ten days in late April and early May, from Friday to Sunday one week and Thursday to Sunday the following week. Like many music festivals, the event includes food, art and music sales, but what sets it aside from others I’ve seen is the strong cultural flavour. 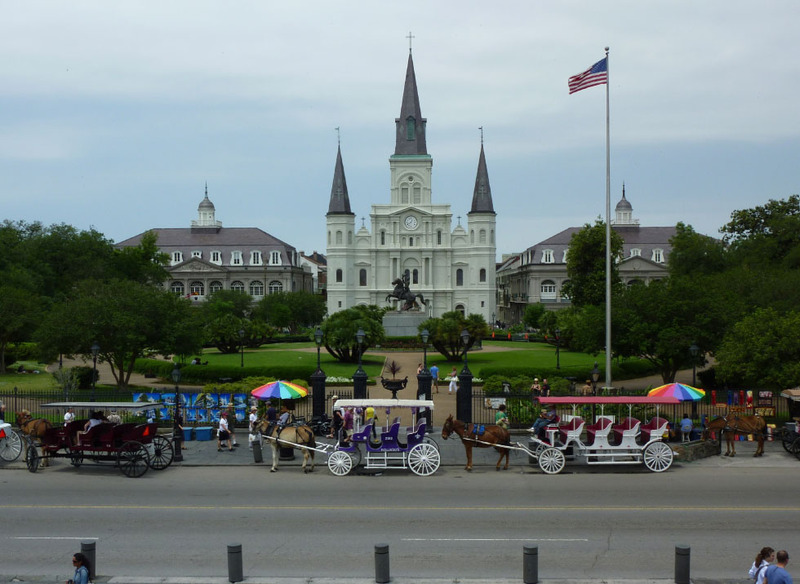 This includes demonstrations of Native American crafts and beadwork by Mardi Gras Indians, a Native American pow wow, exhibits by voodoo practitioners and demonstrations of local blacksmithing and cooking, as well as the famous “second line” musical parades and interviews with many of the Jazz Fest musicians. 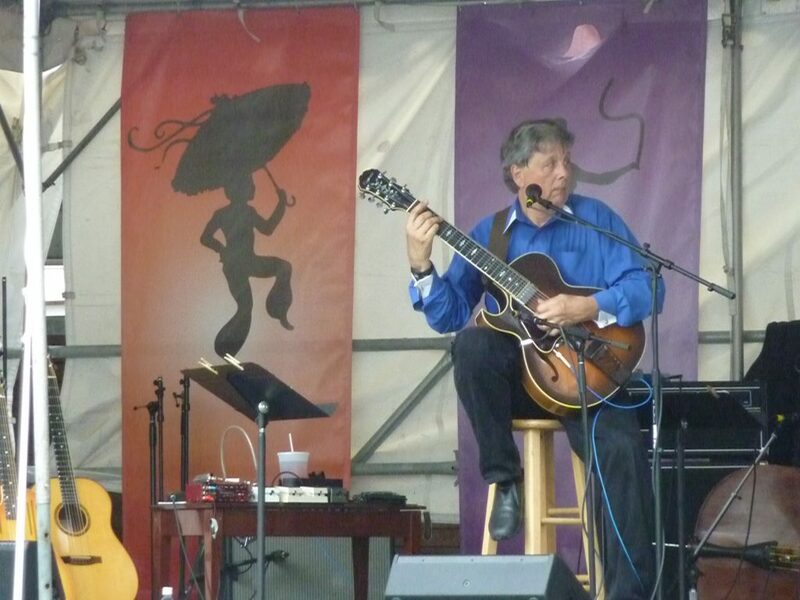 The music at last year’s Jazz Fest was fantastic. The only trouble was that there was so much going on at the twelve different venues it was often hard to decide what to see, making some advance planning useful, especially for the most popular groups. Then again, some people simply set down their blankets or chairs in front of one stage and stayed put throughout the day (even amid the rain that fell one afternoon). But festivals being what they are, spontaneity also paid off for me, yielding some interesting surprises like incredible New Orleans guitarist John Rankin. If you go to New Orleans for Jazz Fest you must plan to spend a couple of extra days to see this historic city. Founded by Montreal-born Jean Baptiste Le Moyne, Sieur de Bienville, in 1717, New Orleans had the strategic importance of controlling the mouth of the Mississippi River and the trade route to the heart of the continent. It would become the largest settlement in “La Louisiane,” an area claimed by the French in 1682 and named after King Louis XIV that included all the Mississippi basin. Louisiana, as it became known, stretched from the Gulf of Mexico as far west as the Rocky Mountains and north to French Canada, even extending into the lower parts of western Canada. Established by a handful of French settlers, the city would grow through the enterprise of European immigrants along with French convicts and prostitutes, slaves taken from West Africa, slaves and free blacks and whites from Saint-Dominigue (now Haiti) and exiled Acadians from what is now Canada’s maritime provinces—the ancestors of today’s Cajuns. Louisiana was controlled by the Spanish for about forty years, transferred back to the French and finally sold to the United States under the Louisiana Purchase in 1803 (see map: http://en.wikipedia.org/wiki/File:United_States_1803-04-1804-03.png). Interestingly, the State of Louisiana, like the Province of Quebec, retained the Napoleonic Code as its form of law, a unique artifact in the United States. All of these many influences can be found in New Orleans today and contribute to its rich character. In spite of the remaining damage around the city, there is still plenty for a visitor to see and do in New Orleans. I would recommend following the progress of history by starting down on the banks of the Mississippi in the French Quarter where the city was founded. 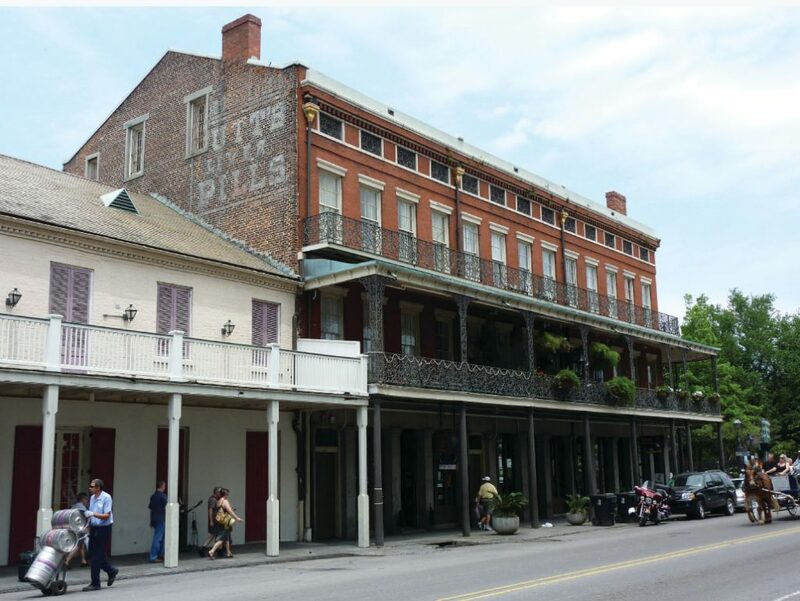 This area is highlighted by the French Market, Jackson Square, and the bawdy and boisterous Bourbon Street. Throughout this area the architecture is mainly Spanish, reflecting the era of growth and rebuilding after a major fire when Spain controlled Louisiana, and features extensive use of wrought iron for balconies and railings. Everywhere the buildings include big overhangs for shade and large windows to create the airiness needed during the oppressive heat of the summer. From here a good guidebook will lead you to the other districts that developed as the city grew and prospered. 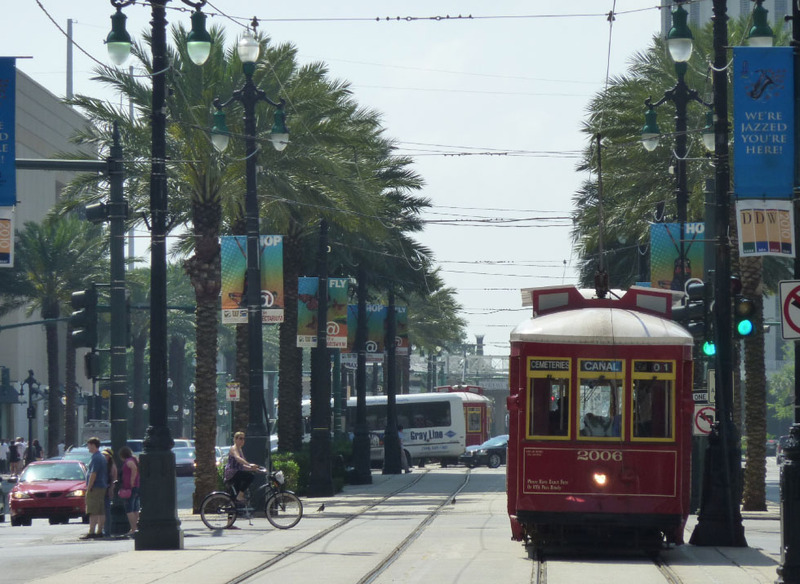 A comprehensive bus and street car system can get you where you want to go if you don’t want to rent a car, but whichever way you travel you will want to experience New Orleans on foot. That’s the only way to smell the aromas of the famous southern restaurants (chef Emeril Lagasse hails from New Orleans), hear the pervasive music that oozes out onto the street, experience the sultriness of the climate and delight in the shade of the huge banyan trees. 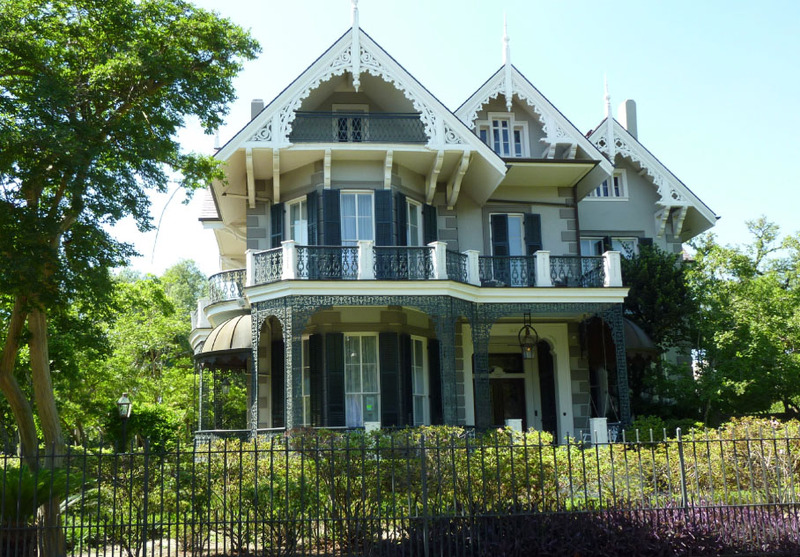 Take a walk around the Garden District just west of Canal Street, for example, and see the magnificent 19th century mansions adorned with white columns and ornate wrought iron work that are nestled among the trees of these shady streets. The spirit of New Orleans is alive and a visitor can’t help but be infected by it, whether you find it in the music, the food or in the friendliness of the people. To plan your trip to the New Orleans Jazz and Heritage Festival see the festival website at http://www.nojazzfest.com/ or check on what’s coming to your neighbourhood or across North America by going to http://festivalnet.com/music_festivals.html. Alan Boreham is a world traveler and writer.